For special moments. 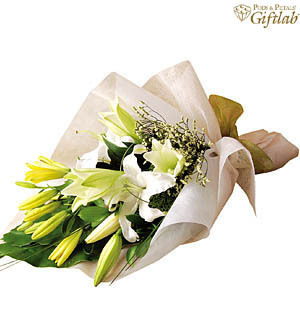 Casablancas Lilies beautifully wrapped. Free delivery applies for order within Klang Valley(Kuala Lumpur, Petaling Jaya, Selangor, WP) only. For outstation delivery within Malaysia, additional charges apply. For customization, contact Pods & Petals Giftlab at +603-78830233 / +6012-6915200 or sales@gift-lab.com for enquiries.